Map showing location of New Jersey on the US map. 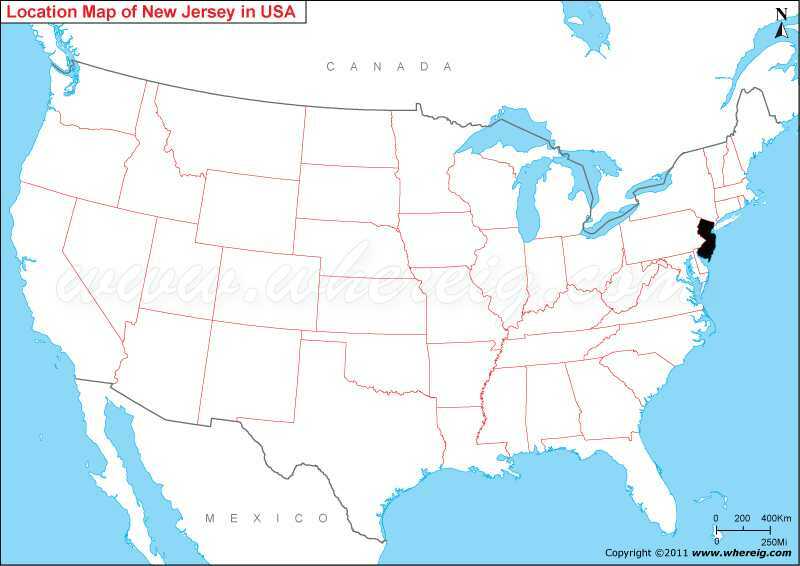 The given New Jersey location map shows that New Jersey is located on the Middle Atlantic coast of Northern-eastern United States. Map of New Jersey also shows that New Jersey shares its state borders with Delaware in the south-west, Pennsylvania in the east, and New York in the north. Besides, it has coastline in the east along the Atlantic Ocean. Likewise, New Jersey lies completely within the sprawling metropolitan areas of New York City and Philadelphia. Surprisingly, New Jersey is the most densely populated state and second wealthiest state in the United States. The capital city of New Jersey is Trenton; however, the largest city is Newark. Other important cities are Jersey City, Paterson, Elizabeth, Edison, and Woodbridge Township. Having the humid continental climate, New Jersey is one of the most preferred tourists destinations. The state has numerous tourists’ attractions including museums, theme parks, sport centers, and entertainment centers.